Special occasion gifts, Valentine's Day gifts for that special romance writer and birthday and holiday gifts that show you care. Gifts that say romance-a home spa day-work well. Do you need a gift for a romance writer? Every day romance writers pound the keyboard and gift us with their stories. They sit at computers all day with their fingers tripping over the keys and tapping their own kind of love songs. But what kind of gift would make them happy? Do you need a few gift ideas for that romance novelist whose birthday is around the corner? Here are a few ideas that may make romance novel authors happy. Gift suggestions run the gamut from a Faberge vase to a silk Kimono to a Book of Kells designed blank book. What is common among all is the appeal to the senses. Most wriers are uncommonly tuned into their senses, so gifts that evoke a sensory experience are valued. Scroll down to see the various gift ideas for those who write and those who love romance. Yes, this is Faberge. Yes, it is engraved crystal. And yes, those are dolphins. There is something beautiful about that combination and, trust me, any writer of romance will appreciate this gift. Perhaps your special romance novelist has memories of cruises and dolphins or visions of one day swimming with the dolphins. Honor that idea with one of your own. A very special gift for a unique and special person. What's the Big Holiday for Romance Writers? 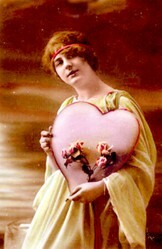 Romance writers love Valentine's Day. While most people seem to find Christmas, Hannukah, and birthdays to be their most celebrated of holidays, romance writers tend to have a higher profile in the weeks leading up to Valentine's Day. Magazine stories interview romance authors and romance writers look to heavy book promotion opportunities during the season. Valentine's Day is big business in the romance industry. Writers, especially romance writers, use their senses every day when they are writing. They think visually, hear dialogue, feel the drape and texture of fabric, remember smells, and recall tastes when they create scenes. But they're at the computer screen all day and sometimes what they really need is a little sensory stimulation. Why not give them a spa gift basket and encourage them to immerse themselves in a home spa experience? Better yet, help them plan a home spa day or weekend and give a truly unique gift. Read on for mroe ideas. The benefits of a home spa day or weekend are huge. In fact, facilitating a home spa day or weekend is a terrific gift for a romance writer or anyone in need of a little rest and relaxation. One of the main benefits from a home spa experience is the feeling of renewal and restoration. A good spa experience is one that produces a restful and relaxed experience. Organization is key to a rewarding experience. Gather all the items that will be needed ahead of time. Some items will include spa treatments like bath salts, facial creams and treatments and aromatherapy oils. Tell friends and family that you and/or the person you are helping plan the spa day will be away from home that day or weekend-only the ones who will be included in the spa activities should know what's going on. That way you can be sure to have the needed quiet time to have a truly relaxing and productive experience. Plan to turn off the cell phone and all electronics that are not conducive to rest and rellaxation. If you must be on call, at least turn on the mute fuction on the cell phone. Oh, and turn off the house phone, too. Prepare to have quiet time where nothing much is done other than sitting and allowing whoever is having the spa day time to shift gears and sink into a slower pace. The day usually moves at a slower pace and reading is often a planned activity by many. It's helpful to have a book that proivdes some inspiration and inspires reflection. Be sure and include a few periods of reading time. Make sure you've chosen your music in advance. The more relaxing, ambient type music helps to make the mental shifts away from daily life. Many people enjoy the sound of water and find it soothing. . Diet is often a crucial part of the spa experience. It's good to plan a menu ahead of time and make sure all the necessary items are on hand. Definitely buy ahead. Once the spa starts, leaving the house should be out of the question. Eating light is often the preferred diet. Having plenty of water and lemonson hand is another spa-like thing to do. Recreate a spa experience as much as possible. It's good to see if any kids can spend the day or weekend at a friend's or relative's house--with instructions not to call except for an extreme emergency. A spa day is traditionally a time to unwind, a time to shift the active mind away from daily concerns and toward a more reflective and inspirational way of thinking. Books and music that encourage that type of thinking are desired to have on hand. Keeping a notebook or journal handy in order to make entries throughout the day is another good thing to do. That way new thoughts and reflections can be captured as they happen. Help make this day all about the person who the spa is intended for. Do whatever you can to make it a good day. At the end of the spa day or weekend, help the person plan a quiet, slow re-entry into daily life--as much as is possible. If you do all that, you will have created a truly wondeful gift. More ideas follow that can enhance the gift-giving or be alternative gifts to the home spa day. Thinking flowers? This truly elegant Fathom patterned vase evokes the majesty of the ocean. Celebrated artist Michael Aram drew on the sea's imagery of bubbles and seaweed. This is a tall vase perfect for a large bouquet of roses, lillies and more. This is simpy a gorgeous vase and the perfect complement to nature's beauty of fresh-cut flowers. Flowers refresh the sense and certainly every home spa experience should include them. Writers read. Romance writers read romance books. The Kindle DX has even more features and makes a perfect gift for any writer. For added fun, add romance ebooks and make it a truly memorable gift-giving occasion. Romance writers often write about the feel of silk against the skin. But do you know that it's also a practical fabric and that it keeps you cool? I love the way silk garments glide on and off. The fabric has a distinct sensual feel to it. Kimonos are wonderful. I remember my mom wearing one when I was a child and how much I lvoed the way it looked. the embroidered designs are fantastic. This one combines the crane, a symbol of longevity, with the deep color of plum. Truly elegant. For a surprising and stunning gift, consider a kimono. A kimono is the perfect attire after a long day of relaxing from home spa treatments and activities. It's a great way to end the day. Do romance novel authors have things to do before they die? Of course they do. Romance writers read romance books, they get ideas for romance, they aspire to be famous romance authors. But is that all there is on their bucket lists? No way. There is something about the touch and feel of a good leather journal that makes a writer or any bibliophile happy. A blank book is a book of possibilities. For writers they become houses for the mind at work. The Book of Kells design goes back in history to the Middle Ages. Stamped gold illuminates the 128 ecru pages. The cover is embossed and gilded. A gorgous book and perfect gift. This is a great book to have on hand to capture those thoughts and relflections during a day of rest and relaxation. When in doubt, you can always go the tried-and-true gift of books. Just make sure your favorite writer doesn't already have the book in question. It never hurts to see what others are doing or saying about the craft of writing and the business of publishing romance novels. A nice book tucked in with another gift is always a bit of a win-win. Playing with Pinterest and books today using this free online tool. This quote definitely has some legs to it. Why Not Try Wizzley for Online Writing Fun? Wizzley is an easy-to-use revenue-generating, online publishing platform that is perfect for writers and entrepreneurs who want to explore a vast array of subjects, promote their work, and find new ways to discuss their favorite topics. The interesting part is that the writing can actually earn you income. So click on the banner and give it a try. Trust me, the learning curve is minimal. It is really easy and a great place to start your online writing or add another venue to your growing web presence. Lego Architecture series is perfect for the brick architect and fan. These Lego building sets have everything, including the Lego architecture bricks, to build famous landmarks. A summary of Texas travel guidebooks that explore history, landscape and cities. A short bio on Vikk Simmons, travel writer, online writer and author of travel guidebooks and YA fiction. She's also a primo dog lover who lives with six opinionated canines. Looking for a great gift for a gardener? Need gift ideas for your gardening friends? Want some unique gardening gift ideas for the holidays or Christms? Read on. Great gifts! Love the page!